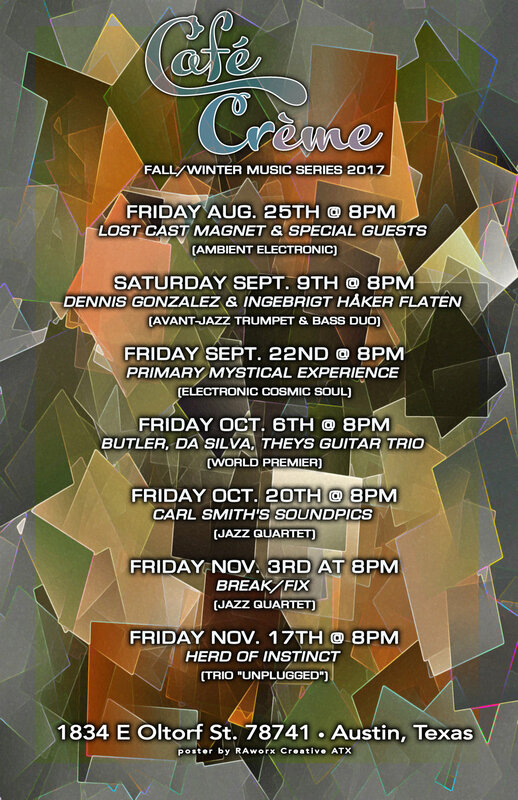 The cozy and locally-owned East side neighborhood coffee house, Café Crème, is hosting their 3rd annual Fall/Winter Music Series 2017, where several dynamic genres are being featured - such as avant-jazz, improvised music, electronic, and more. Since Café Crème's opening, the owners have used their space as an experimental music listening room and a home for musical styles not well-known in the Austin scene. artist who creates electro prog, avant new wave, trance groove music, noise, and several other genres with special guests. Check out the footage on the Facebook event here. On September 9th, the cafe hosted its second show with jazz extraordinaire, Ingebrigt Håker Flaten, and avant-jazz trumpeter, Dennis Gonzalez. View all of the coverage on the Facebook event here. Primary Mystical Experience performed on September 22nd - a solo project of Jared Marshall that blends live drumming, soulful vocals, and modular synthesis with mixtape-style beats, ambient journeying, and improvisational exploration. Read more on the event at OtherSide News by Charles Anderson. On October 6th, three creative and accomplished musicians gave a debut performance as an improvisational guitar trio. Read all about their backgrounds at the Facebook event here. On October 20th, Soundpics performed a music and arts show - where the paintings displayed also served as a musical composition. Pictures of the paintings were projected on a wall for the musicians and the audience to see. They were set in a specific order, paced like a musical composition. See the footage on the Facebook event here. On November 3rd, Break/Fix filled the listening room with a one-of-a-kind experience. The ensemble (saxophonist Joshua Thomson, cellist Henna Chou, and percussionist Aaron Parks) pursues a variety of sonic approaches to improvisation that involve imagery, conceptual frameworks, as well approaches informed by western and eastern music disciplines. See the recent coverage on the Facebook event here. The final event will be on Friday, November 17th with prog rock band, Herd of Instinct!